UK recycling industry stalwart Chris White has joined Closed Loop Recycling as commercial manager ahead of an exciting year for the innovative Dagenham-based recycling company. Chris White is a well known and highly respected personality in the recycling industry, thanks to his 41 years at Aylesford Newsprint where he held numerous roles including most recently that of commercial manager. In recent years, Chris has become well known for his views on quality and is an advocate of high quality sorting at materials recycling facilities. His new role at Closed Loop Recycling will see him overseeing the company’s partnerships with its key customers including Veolia Environmental Services, with whom Closed Loop recently agreed a new deal to supply its state of the art facility with PET and HDPE. 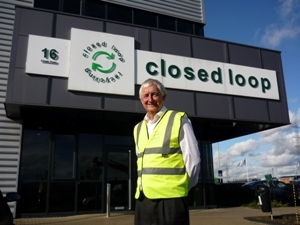 Commenting on his appointment, Chris White said: “I’m really pleased to be joining Closed Loop Recycling at this time in its development as 2013 is set to be a very exciting year for the company. Closed Loop Recycling was the first facility in the world to recycle both PET and HDPE plastic bottles into food grade material for new food and drink packaging. The company has ambitious expansion plans which will significantly increase the current input capacity of its Dagenham plant, creating the most advanced plastics purification facility in the UK. The existing Dagenham plant has been operating since December 2008. Current capacity allows the production of 35,000 tonnes of mixed plastic bottles, producing 11,000 tonnes of rPET and 6,000 tonnes of rHDPE per annum.